Gurney's Superfood Salad Blend | Gurney's Seed & Nursery Co. 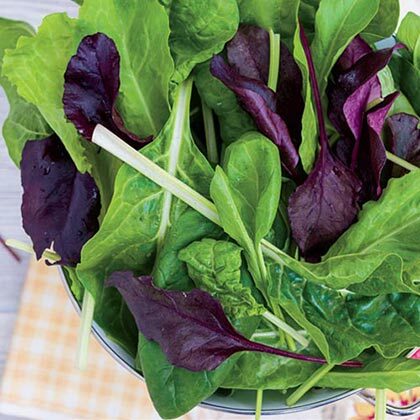 This gourmet mixture of endive, chicory, beet greens, chard and spinach offers a delectable mix of tastes and textures, as well as a BIG nutritional boost. Approx. 25-55 DAYS. Spacing3 - 4 inches between plants, 12 - 18 inches between rows. FoliageMixed texture and color of foliage. Seed CountApproximately 100 seeds per packet. CommentsRhodos Endive- finely cut foliage is attractive in salad blends and has a pleasant bitter taste. Eros Chicory- light green leaves with bright peppery flavor, easy to harvest. Soldier Beet- very pretty red leaves & veins, an excellent variety for tasty beet greens. Silverstar Chard- glossy green leaves with white stems, very vigorous and attractive alone or in greens blends. Delta Swiss Chard- green leaves with green veins, excellent at baby leaf stage and mature size. 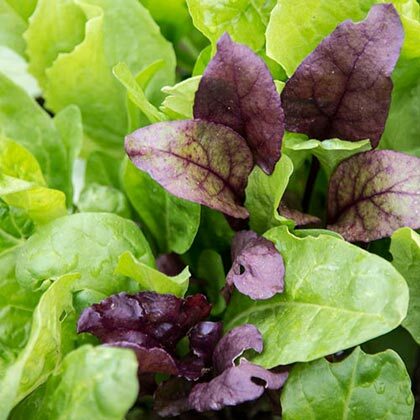 Renegade Spinach- smooth leaf, good for Spring, Summer & Fall, great disease resistance and flavor. Botanical NameBlend of: Endive Rhodos, Chicory Eros, Beet Soldier Hybrid, Chard Silverstar, Spinach Beet Delta (chard), Spinach Renegade Hybrid. Days To Maturity25 - 65 days.